This is the place and environment where imagination comes to life. Our 4,000-square-foot sound stage is perfect for multi-camera and live television shoots, commercial shoots, music videos and corporate training videos, with a 50’x80′ stage, hard-corner 73’x40′ cyc wall and a full-time air conditioning system. Large, 12’x15′ loading doors are able to accommodate cars, boats, even a semi-truck – so dream big! On stage, you’ll have 600 amps of power at your fingertips along with a full lighting grid. 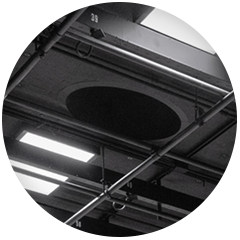 When it comes to soundproofing, your resonance frequency is virtually nonexistent thanks to a 4-inch floating concrete floor and NC-20 sound rating. This full time A/C pumps out 80 tons of chilled air SILENTLY. No need to turn the A/C off while shooting. 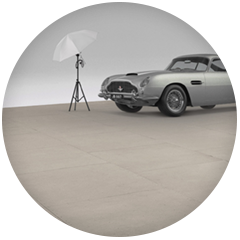 4-inch floating concrete floor supports 2 inches of sand and three layers of ¾-inch plywood for sound and vibration isolation. 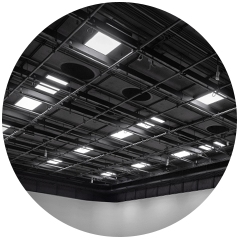 Fully controllable lighting grid with DMX controller and state-of-the-art LED lighting. 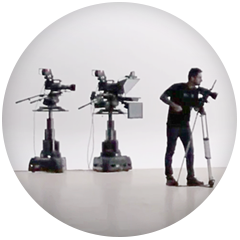 These are the top of the line manned and robotic pedestals and cameras for live television production.